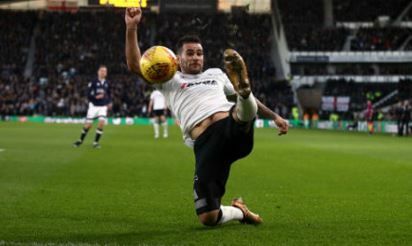 Three goals in five first half minutes sealed the game for Derby County and with the win moved Derby County to third place in the Championship and within three points of an automatic promotion place. David Nugent started the goal rush in the 23rd minute. A Rams corner was swung over by Chris Baird and met by David Nugent, sending the ball across the keeper and into the net. Just two minutes later goal machine, Matej Vydra made it 2-0 a pin point pass by Nugent left Vydra with a 20 yard shot, which found the corner of the Millwall goal. The game was put to bed in the 28th minute in spectacular style as a ball which look as though it was going out for a goal kick was not only saved from going over the by-line but crossed a great ball for Nugent to head his second goal of the game. All over by half time but an entertaining second half saw the Rams win their 10th game out of the last 14 and that has to be promotion form. The question is do they have the stamina for a second half to the season. If the Rams stay injury free and maintain their present form 2018 looks to be looking good already.